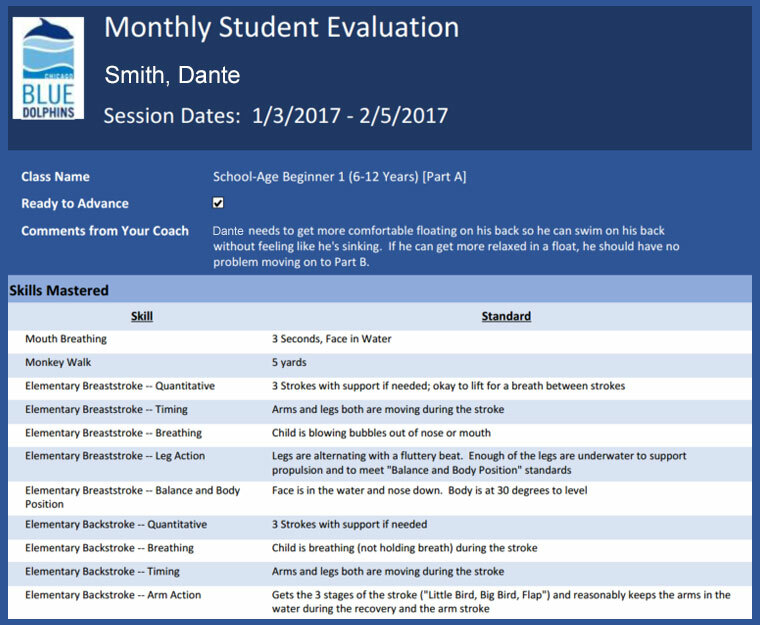 This is a sample of the new, two-page evaluation swim students will receive every month by email. Who among us loved report card day in school and woke up early in anticipation of all the A’s that were soon to come? We pride ourselves on exceptional swim instruction at Chicago Blue Dolphins. And for each course, there’s a standard checklist of skills that your swim coach is evaluating you on during every class. This allows your coach to see where you need more help and which skills you need to master before advancing to the next level. The list of skills each swim student is specifically working on. Which skills a student has mastered. Which skills need more practice. We want you to have a better idea of the purpose of our classes. For parents who take your to practice outside of class, we want you to know which skills need more work. Beginning this month, we’ll be emailing the pdf reports every five weeks. We’ll be storing them in a database so we can review student progress from session to session. This gives you the ability to see your progress, or your child’s progress, over the long term. It also gives us a chance to see where there might be learning roadblocks for certain students. For example, if Jenny isn’t flexing her feet in the breaststroke kick and it’s on 3 reports, what do we need to do to address that? We hope you find the Student Evaluations helpful and informative, and we welcome your questions or feedback after you receive yours. Last But Not Least: During Evaluation Week, it’s mission critical that students who are close to advancing to the next level make it to class or schedule a make-up. Otherwise, we won’t be able to complete your final evaluation, clearing you to advance.